Cheap White Economy Masks- 12 Ct. Affordable masks. Economically priced masks priced for large scale Halloween party or masquerade events. 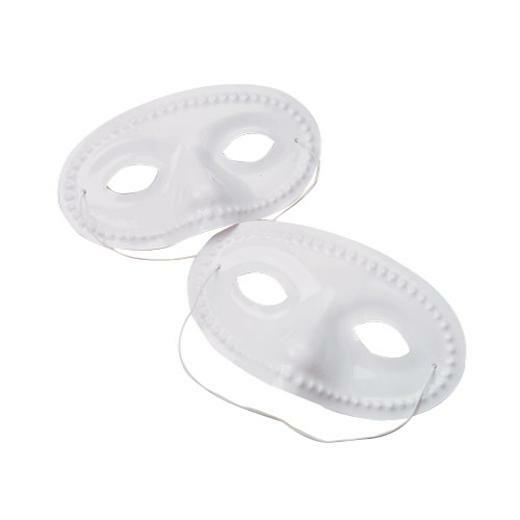 Disguise your face using these white plastic masks. Molded to fit your face for extra comfort. Masquerade or costume parties are a great way to entertain. Make sure all your guests can participate in the fun by giving a way a mask as a party favor. Party guests love to be in disguise. Stock up on eye and half masks to make your night a success! L: 5.3 in. W: 1.55 in. H: 9.05 in.